Yes, you read it! I surely wont pass this race! Race a Half marathon, on your neighborhood! Anyway, this race was postpone twice! It suppose to be held on July, I signed up for 10K! I wasn’t feel like doing HM after Eid Fitri, later I signed up for HM in Jakarta City Marathon that suppose to be held kn October 21st! Yes, suppose to be! The race was cancelled few days before the D day! since I’ll have BIG race early next year, I’ve to crush it anyway. As I guess, not so many participants. i didn’t wear our group Jersey because I was planning not to finish it :)) jadi jangan sampe ketanda anak BTR. Gun off exactly 5 am! The off we run. Being slow as snail I am, I was really really at the last runners in 10 minutes! Hahaha! Made friends with few people along the way. One of them is Mitha, who was doing her virgin HM. 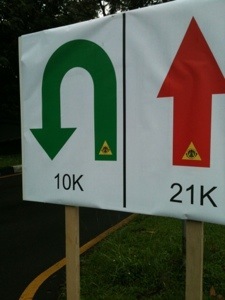 Track was running through Bintaro Boulevard. So, nothing new for us, of course. I feel like I was doing my regular Sunday Morning but with free water station every 3Km. The water station were greats. Cold drinks, mineral and isotonic. We were running for two loops, each 10,5x. So I saw many of my friends had made a U-turn. After U turn in jalan Graha Baru, Mika seemed tired. She couldn’t run anymore She didn’t prepare any intake. 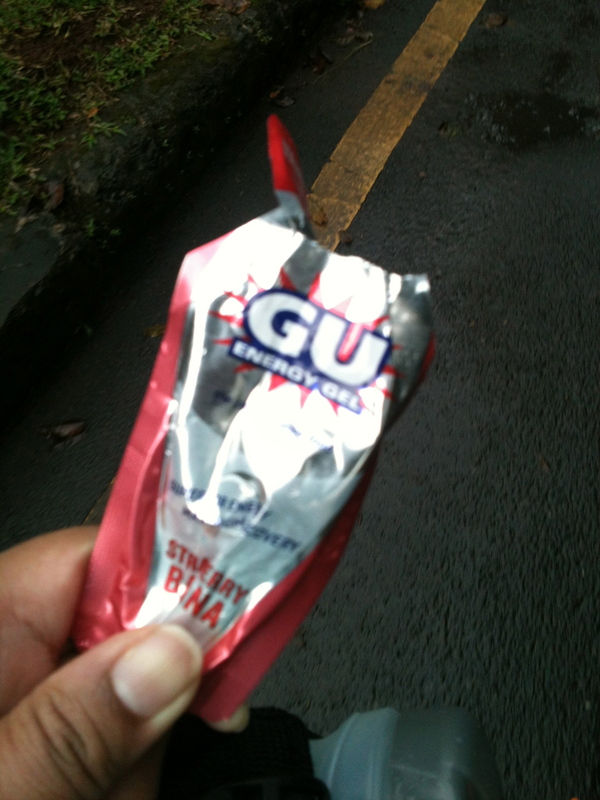 i gave her my Gu Gel for her refueling. Then I left her. 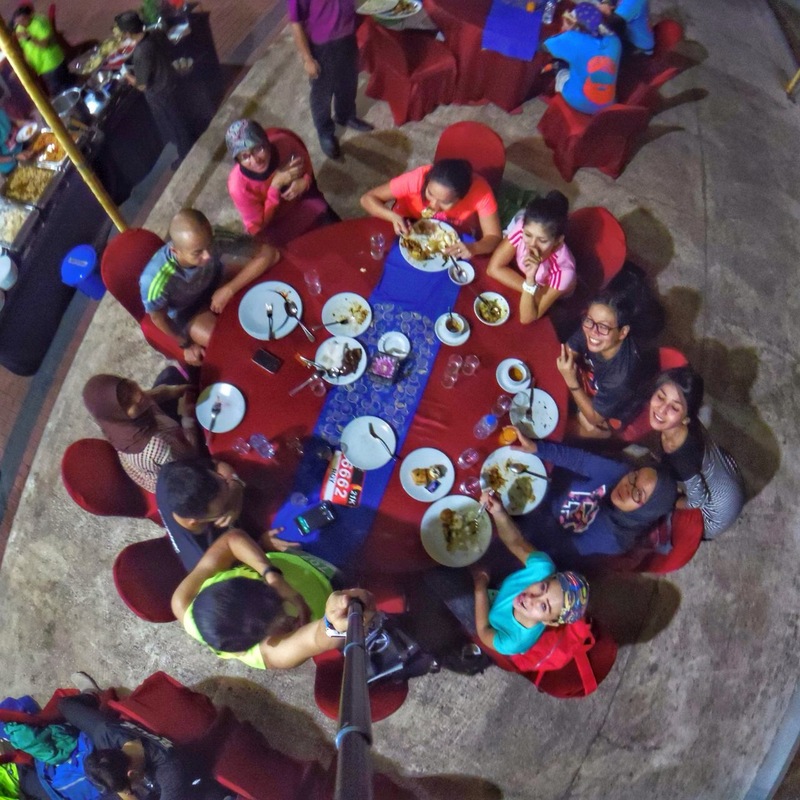 Please note this one people, endurance sport needs refueling during the event! To keep moving, you need energy! I was doing ok or I thought I was. Under 9 mins /Kilo. This is how I run now, very slow. That made I crushed 10K for 1.5 hours, as My initial plan. 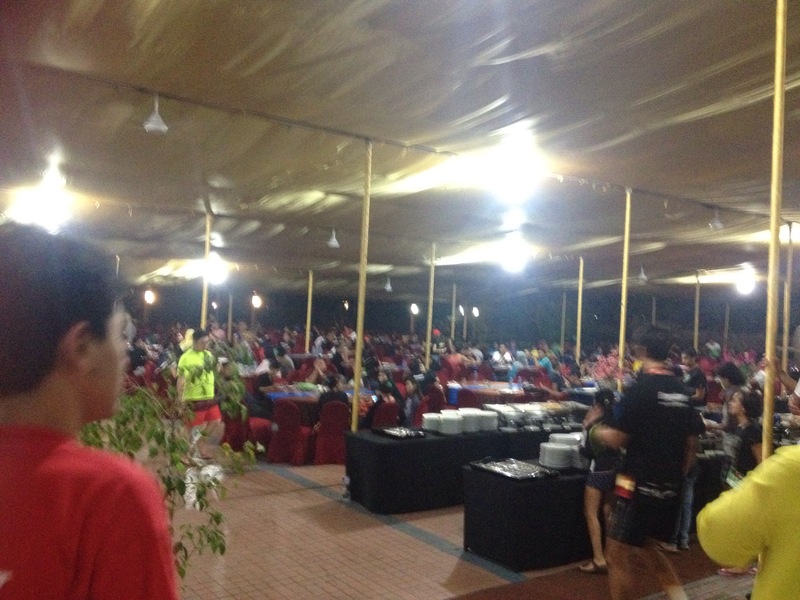 Run for another loops, I was still doing ok. Bumped into some acquisitions, 5K – 10K participants on the other side. Have you see this pic already on my previous posts? Weather was fine. Not too hot. 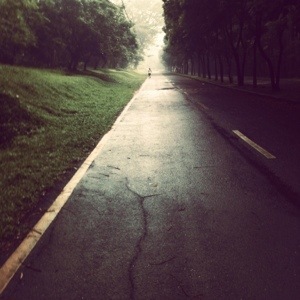 It’s rainy season anyway and I made a pray neither hot or rainy. But after the last U-turn, I walked most of the time. I saw there were still few runners on the other side. This race had a friendly COT (Cut Off Time) 4 hours for Half Marathon. I was thinking of going straight to my house after Mc Donald! Hahahaha. My house is 1K- to the right – of that big M logo . But then I made conversation with other slow runners and suddenly I forgot my initial plan. When I recalled my initial Plan, the distance to my house and finish line was about the same. Yahh okelah, kita selesaikan saja apa yang dimulai ini. One Kilo before the finish lined, my pace gets even slower. My legs were hard to move although I didn’t suffer from any cramp. Then I saw a familiar face running towards me! “hurry up, we were waiting for you. 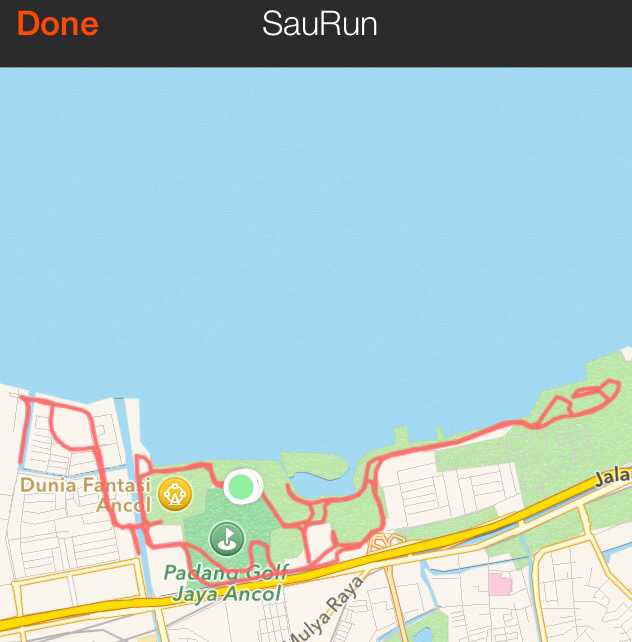 Dikit lagi finish” she said….and run with me for the last 800 meters. 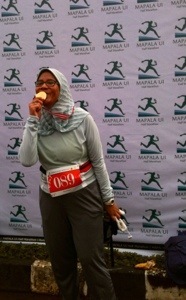 It was Kumala, who paced me to finish line. She had finished her run 45 mins earlier. very sweet of her. it was in December 2014, when I had 4 eyes conversation with Ishida-san back In Singapore #penting #pisan, a text message arrived at my mobile phone said my credit card was charged Euro 100++ for SCC events! later we knew that Riefa, Corry and Kak Oi were coming too! well as told here , 2 months before the D Day I was supervised by a coach. my level of fitness and endurace dropped to its lowest point #meh. 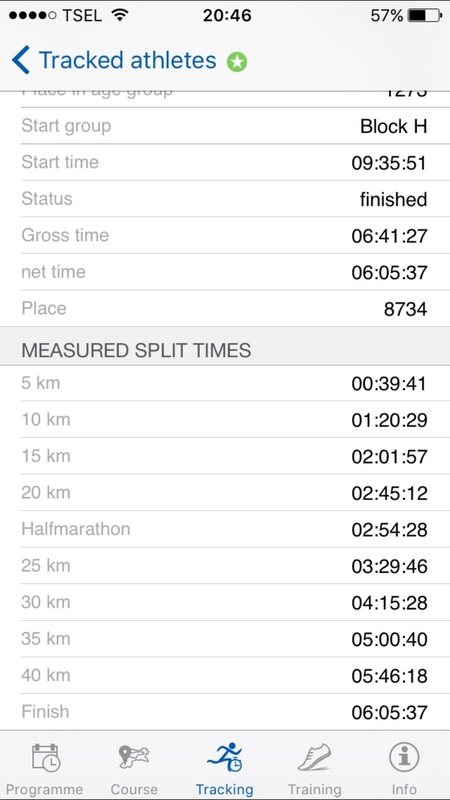 I finished my 30K practice in….5 hour something! Felt like a loser already! picking up race pack at the expo. 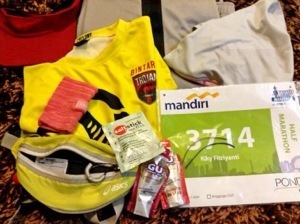 for runners, before picking up the race pack, it is mandatory for us to wear the blue bracellet until the race day. and must show it to the starting pen area.’s a sign that you’re a legal runners not using fake BIB. and owh, I picked the finisher tee too. 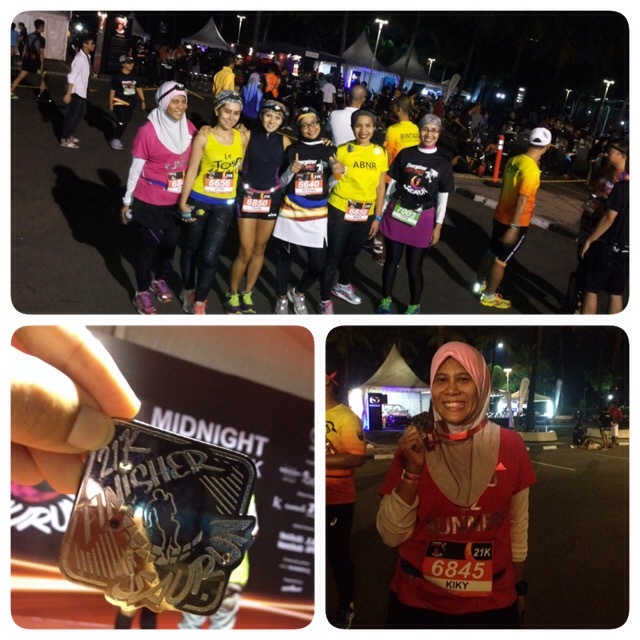 yes, unlike SCMS, BMBM, or else may be, the finisher tee is not part of registration fee. I paid for another 30euro if i’m not mistaken. forgot! 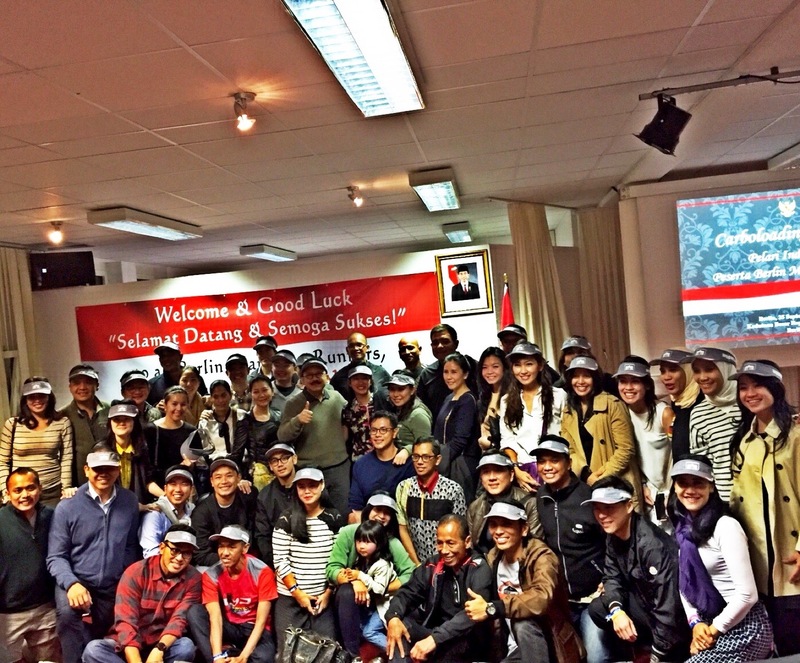 we had carboloading held by Indonesia’s embassy in berlin. The embassy also gave us visor with #INDONESIA on the left and German’s flag on the right. Or is it the other way around? I thought indonesian people are hardly have manner to queue ..eh yakkk sama ajaaa masakkkk!!!! wake up early *oh my gosh!! what was I thinking before??? went to Berlin for a M.A.R.A.T.H.O.N?? cem betullll aja! we had breakfast at the hotel which is a partner of this event. its restaurant opens at 6 am on the D day and we saw many runners around. 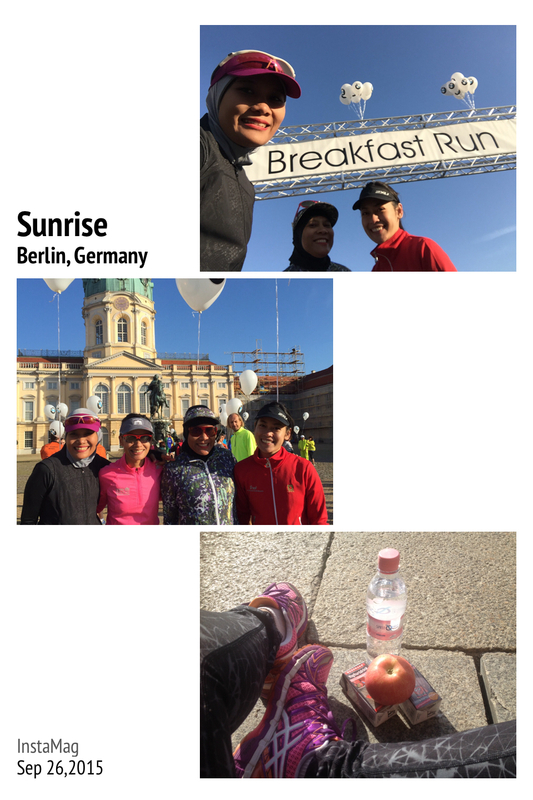 at 7 am met Prasti at Postdemar Platz then heading to start pen, some dropped its bag, and met with other runners from Jakarta/Tangsel. Picture credit to Riefa. at 9.40 something, start for H wave. Coach R said DON’T try to make a PB on your long run race!!! so, spare 3-5 mins from your PB. 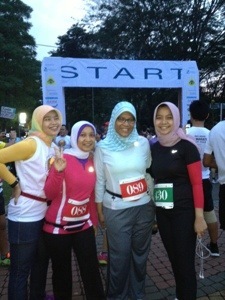 my PB for 5K was 35 mins, and it was 39 mins when I saw 5 K mark. at 10Km mark i recorded 1 hr 20 mins, which is still far from my PB of 1 hr 14 mins. Oh well, I’m within the pace. weeks of training my 10K always last over 1 and half hour!!! I used my salt stick every 7Km, I brought 5 and two Snickers Bars. at Km 18 i felt a noticeable cramp in my right calf. I saw medic team they said they dont have that spray nor the balm. Silly me! i forgot my own note written on my virgin FM! I felt that my body temperature is getting high. Then I took my jacket. I can’t throw it away, it’s Lulu Lemon #jahhahahahahha #dia #pamer! That’s why better you bring your -emang-ngga-mau-dipake-lagi- jacket. I think it was between Km 21 – Km 24 when a West Asia looking boy at about my kids’s age look puzzled at me and asked me with a very decent English — mind you, I ran in non English speaking country — “ Where do you come from?”later he said “good luck, Kiky”Puzzled because I’m the one which he saw wore hijab, perhaps. :)). At around this area, there is also a shower in which, I didn’t need. Hello!!! its 16 degres my man!!! 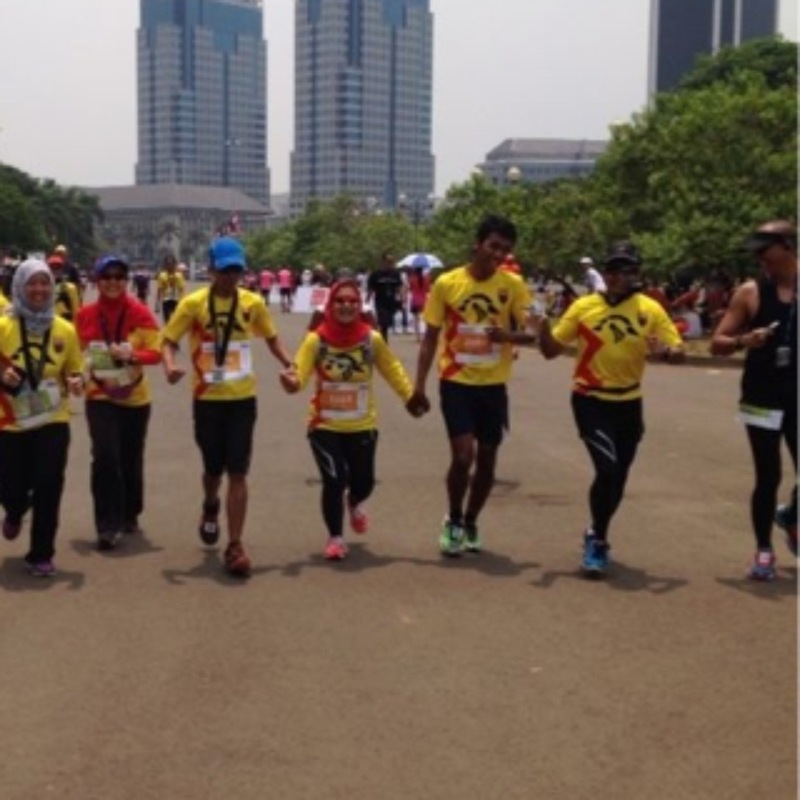 OOT (lagi) kenapa ngga ada di Jakarta Marathon ya pancuran ini? penting banget lhooo kalo udara tropis sih. 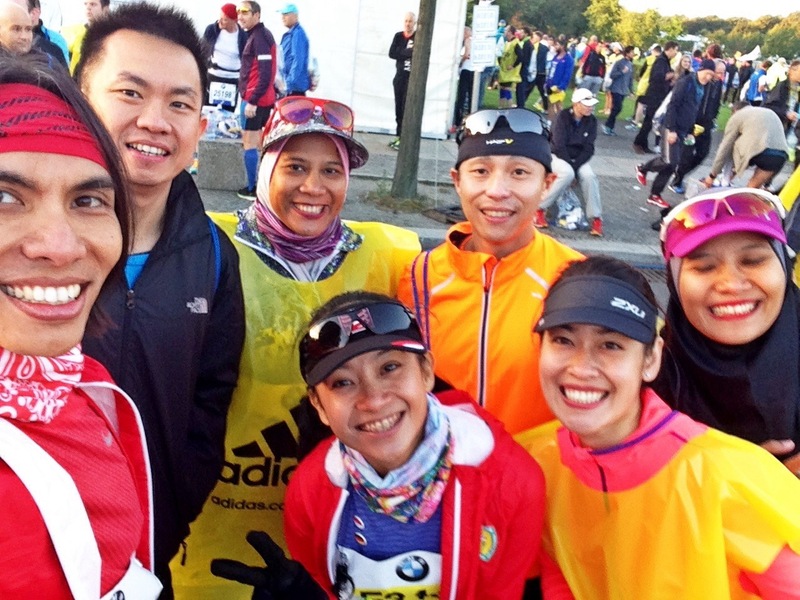 Di KL Marathon aja ada! they also provided this service in Km 31. But when I got to Km 31, literally no runners around. I think it was at Km 30, my mood of running dropped to its lowest point. Only less than 2 hour left and I’m soooo far for the finish line! 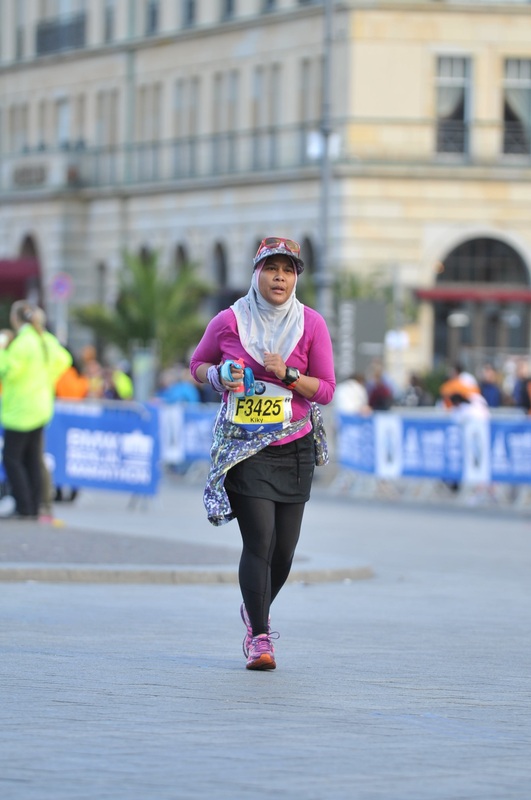 I know how I run, completing 15 km in 2 hours would be impossible for me. Gw udah mulai malas-malasan….gee! I came this far and DNF! What a shame. 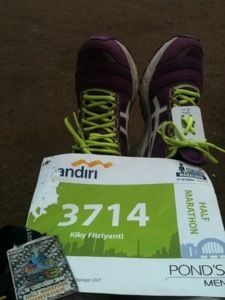 yet, at Km 32 then I realized…eyampun….tinggal 10Km lagi yaaaa bukan 13 Km!!! bahahahahhaha semangat lagi…. but hell, yeah, I saw some finishers also cheering us up! udah kelar dari dua jam yang lalu kayaknya. 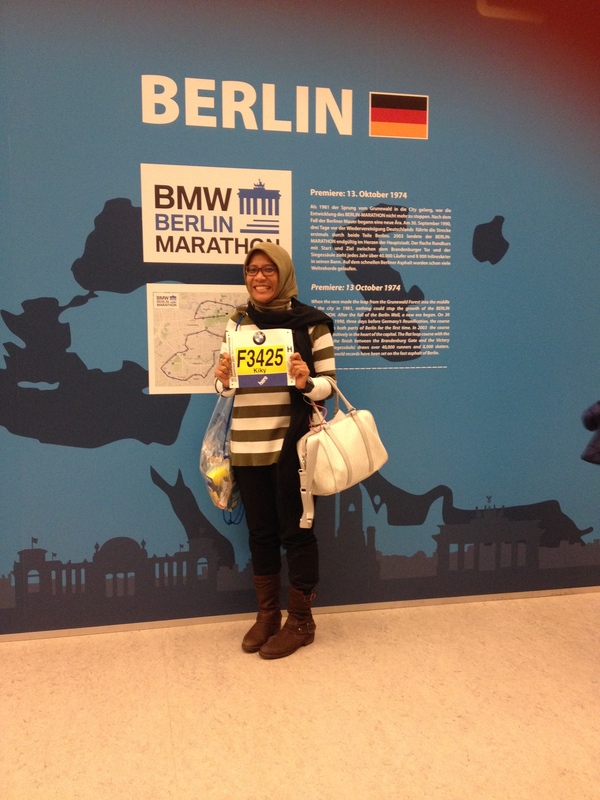 lucky, it’s in Berlin, not Sudirman! Where the temperature was 16 degrees something. 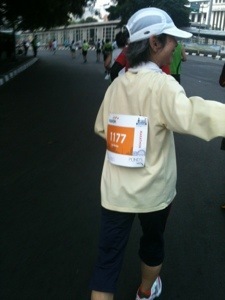 But just to make thing worst, I got passed by many many many eldery joggers! Oh nope, they were doing POWER WALK, yet wayyyyyyyy faster than I was who (was trying) to jog!!! Asli malu cuyy!!! tuh udah beneran kakek nenek, I bet older than my daddy! Anyway Just toooo make it fast… here I saw the Brandenbug Torr..and owh wait! What? finish line is still 500m away. 1km terlama dalam hidup gw kayaknya! 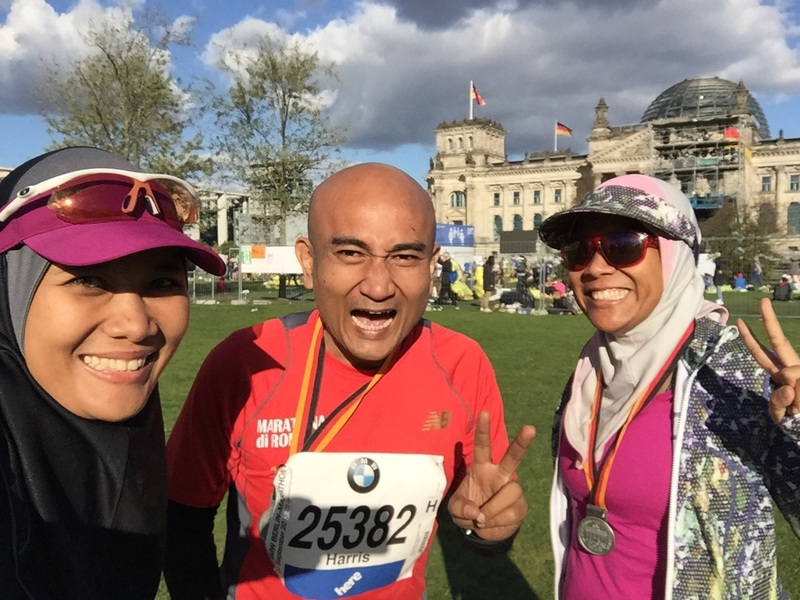 Anyway, after the race, made friend from KL who would be participating again the following week at Lindau, Sparkasse Marathon, namanya. Larinya lewat 3 negara German, Austria and Swiss. 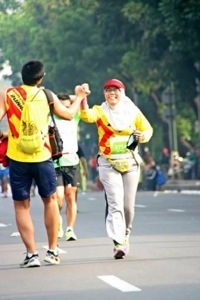 Cakep view-nya tapi yaah beliau sakit jiwa kayaknya =)) Back to back marathon! bla bla bla… then we went out of the area to take pictures in its landmark with Namira. When we were busy taking pictures,a lady later I know her name was Gabriella approached me and asked where do I come from and whyyyyyy I wore hijab! Aih, seru amat sih ini! Muka gw muka gossip kali yaw! Then we took pictures with her, Gabriel came from Hannover if I’m not mistaken! She also had our pictures in her camera. Hi Gabrielle!!! 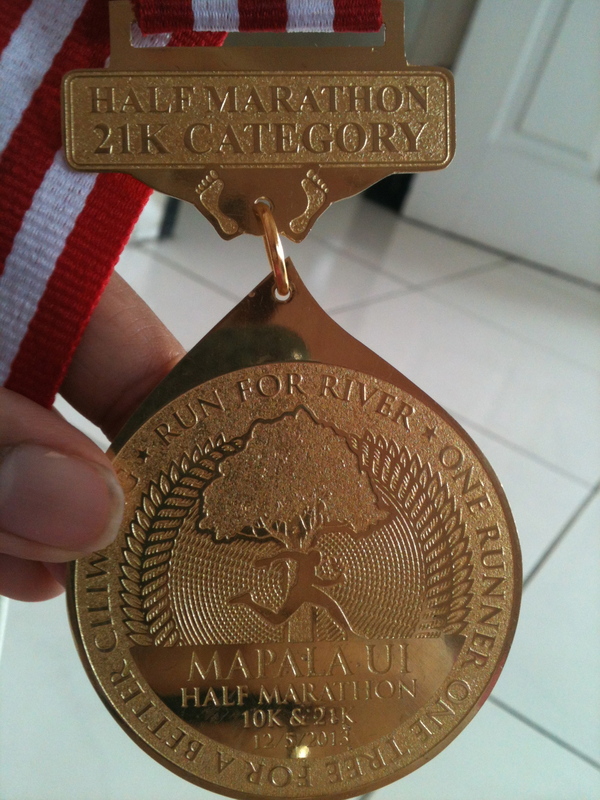 So, last week was my second half marathon race. 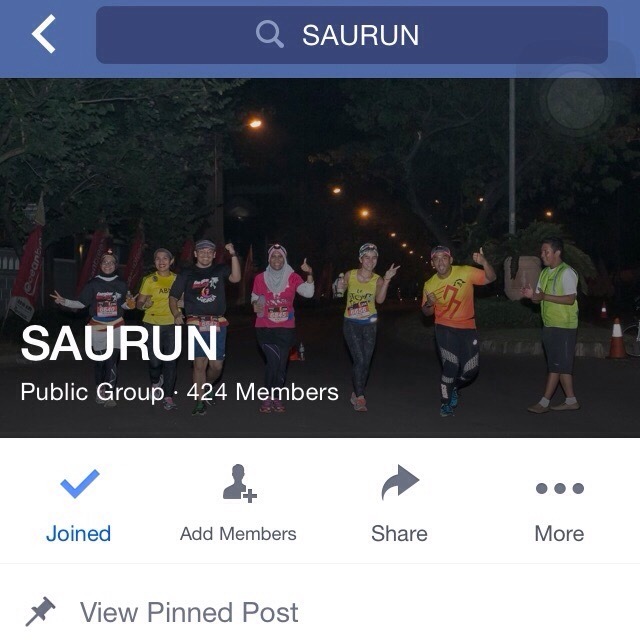 Event ini menurut banyak orang paling parah dari pendaftaran, pembayaran, publikasi, promosi bahkan….yang paling parah: pengambilan race pack yang buat banyak peserta antri berjam jam bahkan ada yang sampe 7 jam! However, ntah kenapa gw excited aja! Apalagi rutenya bener bener baru. Gw pun merelakan tiket One Republic gw hangus supaya bisa bangun pagi walaupun sudah bela belain nginap di Hotel Morrisey! Semua berdoa, dibalik kekacrutan yang terjadi, semoga race aman. A happy overweight slow runner. Banyak surprise juga gw ketemu tetangga jaman dulu yang kini tinggal di singapur. 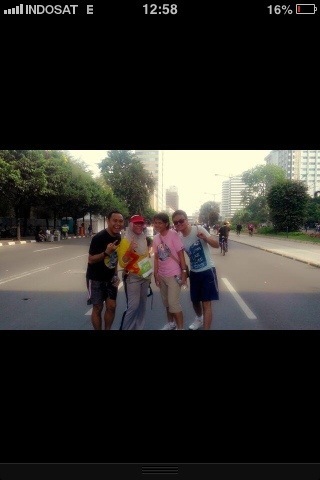 Done his Full Marathon 3 jam 45 menit! Sintinggg. Gw nunggu beberapa teman bintaro yang ambil FM, duh banyak momen mengharukan sihhhh pas finish itu. After pak aryo dan pak hasbi finish with in 5 hours, gw balik ke hotel mandi jemput anak anak, balik lagi ke Monas mau nungguin mbak Nining. And I tell you what. Finishing a marathon is one epic moment. mbak nining was crying all the way from HI ke finish, kepanasan, kram, lari sendirian, your body said no yet your mind said go head. So, kita ‘jemput’ dia lari sama sama gandengan tangan ke garis finish. She completed in 6 hours 59 mins. Mepet cut off time jam 12 siang! Yoiiiii! 12 siang. Start lomba jam 5 teng!